Each year, scores of females participate in beauty pageants around the world, despite a century’s worth of tensions between feminists and pageant proponents around the perceived objectification of women through these contests. Modern beauty pageants have evolved to incorporate talent and interview portions, but the swimsuit and evening gown components, both based on the physical beauty and poise of the contestants, still comprise fifteen and twenty percent respectively of the competition’s total score. 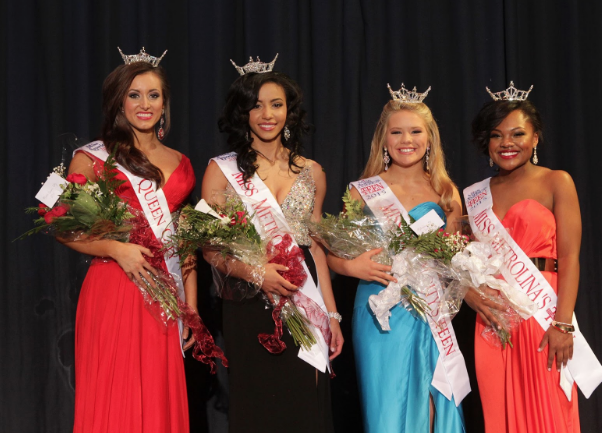 Today, pageants award scholarship money to the winners, and, in recent years, beauty pageant contestants are using their positions to bring awareness to social and global issues of their choice. Yet in spite of the evolution and modernization of beauty pageants, women are still judged, rated, and compared based on an age-old beauty standard. The first modern beauty pageant was held by P.T. Barnum in 1854 but was shut down due to protests. The Miss America pageant, first held in 1921, set the precedent for beauty pageants as they exist today. Throughout the 1930s, a “Rule 7” stated that contestants must be healthy and “of the white race.” In 1938, the talent portion was introduced into the competition, but at the same time, the rules for entry changed, limiting viable contestants to single, never-married women between the ages of 18 and 28. Knowler remembers an occasion when feminist activists entered the beauty pageant and began throwing eggs at the contestants. She says the activists screamed that the pageant contestants did nothing but hold women back. “All of my hard work with raising thousands for charity and helping victims of domestic violence find their voice and courage with my words was crashing around me,” said Knowler. If she didn’t do pageants, Knowler says, she’d probably be sitting on the sofa watching Netflix. “But [pageants] gave me the drive and motivation to actually do something, and give a voice to those who without my support, wouldn’t be heard.” Knower says that true feminism is women choosing what they want to do, even if that choice is to compete in pageants.